The weekend see’s me away for a couple of days. The medium of this one tends to dry up quite quickly, so I thought a dressing of Spagnum moss could be called for. Prior to watering I applied a 1-2cm thick layer of spagnum moss and watered it through. Hope it keeps the moisture in we’re having a slight warm spell coming our way! This tree is already tucked away in a pot shaded area, down behind a fence so that the wind doesn’t dry it too much also. Even my potentilla is tucked in behind there… This one is on a small bonsai dish filled with water to keep up the moisture also. 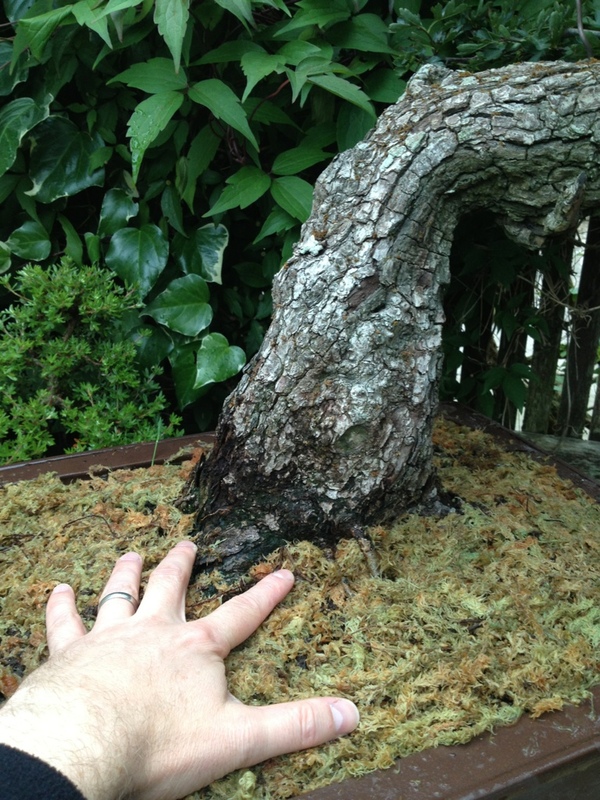 This entry was posted in My Trees and tagged Bonsai hawthorn. Bookmark the permalink. Bri are you not at all worried that the Hawthorn will send roots up in to the moss rather than out and down where you want them? I’m not worried about the roots heading upward at all. It’s a case of keep the tree moist or let it dry out in all that warm weather. Better having an alive tree! !